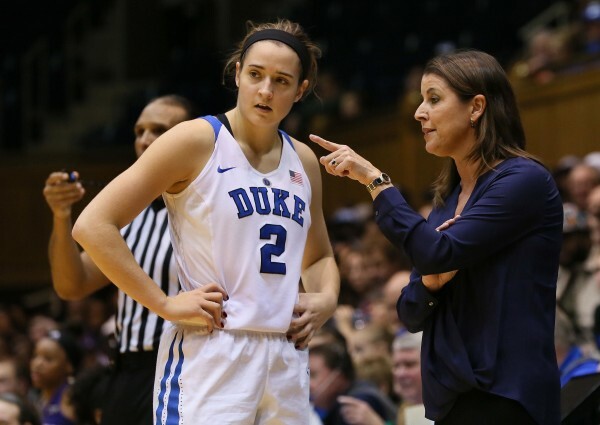 Duke Blue Devils head coach Joanne McCallie talks to guard Haley Gorecki (2) on the sidelines in their game against the Western Carolina Lady Catamounts at Cameron Indoor Stadium in Durham, North Carolina, Dec. 29, 2015. Joanne P. McCallie is staying on as the head coach of the Duke women’s basketball team following an investigation by the school into the program, Duke Athletics Director Kevin White announced late Sunday night, the newsobserver.com reported. “Joanne P. McCallie is, and will be, our head women’s basketball coach and we support her,” White said in a statement released by the school. McCallie is a former University of Maine women’s basketball coach who was also an All-Maine player at Brunswick High School. Duke initiated its investigation in mid-April after the recently announced departures of two players, Azura Stevens and Angela Salvadores. Several players had left Duke prematurely in recent years. The list includes Sierra Moore after the 2012-2013 season and Alexis Jones (2013-2014), along with Kianna Holland and Sierra Calhoun, each of whom lasted only one semester before transferring. All headed to high-profile programs, including Penn State, Baylor and Ohio State. Duke admitted that it was conducting an evaluation of the women’s basketball program after an SB nation website, Swish Appeal, reported April 12 that the school was investigating the program and McCallie for the mistreatment of players and assistant coaches. On Sunday night, White received the results of the evaluation. McCallie recently completed her ninth season at Duke, where her teams have compiled a 245-65 record (.790) with six Sweet 16 appearances and four Elite Eight bids. The Blue Devils failed to reach the NCAA tournament this season when they went 20-12 and lost six of their last 10 games, including an ACC quarterfinal. McCallie coached at UMaine from 1992 to 2000, directing the Black Bears to a 167-73 record and six consecutive trips to the NCAA tournament. That included the program’s only NCAA win, a first-round victory over Stanford in 1999. White was UMaine’s athletic director from 1987-1991. McCallie owns a career coaching mark of 561-213, including a seven-year stint at Michigan State from 2000 to 2007. She was the Associated Press National Coach of the Year in 2005 and the ACC’s top coach in 2010, 2012 and 2013. McCallie also won America East (1999) and North Atlantic Conference (1995, 1996) coaching honors. McCallie was born in California, then moved to Maine where she was a two-time Parade All-American at Brunswick High School. She played her college ball at Northwestern. She has been inducted into the Maine Sports Hall of Fame, the Maine Basketball Hall of Fame and the University of Maine Sports Hall of Fame.